with a long open sweep of beach, which has been awarded the European Blue Flag, right on the doorstep. 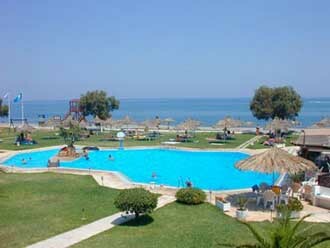 Yet, not far away and within walking distance is the popular tourist resort of Platanias. The Geraniotis has become noted for its friendly cosmopolitan atmosphere. The reception area is large with a comfortable seating area, modern bar and TV room. The bedrooms all have a telephone, radio, central heating, shower/wc and balcony, some of which have a sea view. The hotel has a large swimming pool with sun loungers at an extra charge, a pool bar, children's playground, an excellent restaurant and outdoor dining terrace, and on the beach plenty of opportunities for water sport and volley ball.